The Knitting Pirate » In Which the Pirate Casts Hexes. « In Which the Pirate Crochets! In Which the Pirate Casts Hexes. I have been making hexagons! 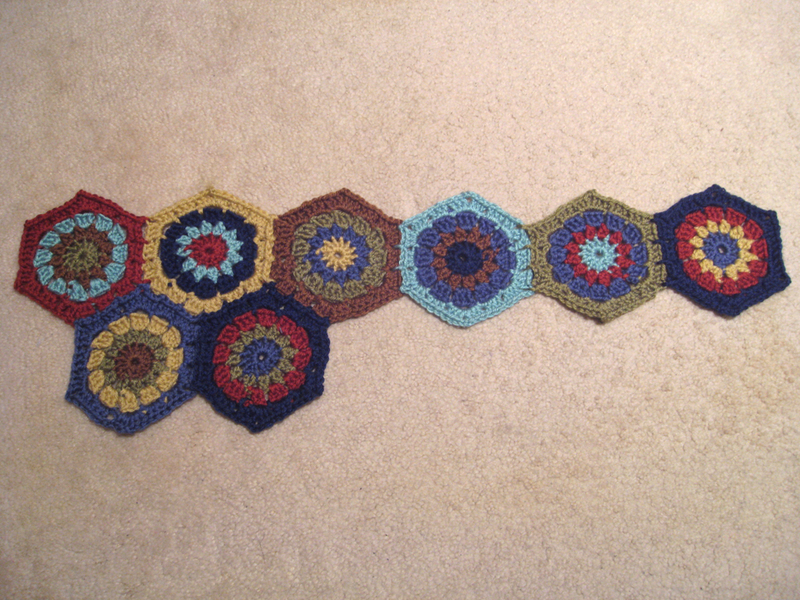 Lots and lots - okay, eight - hexagons so far, which I am joining together as I go, to make a baby blanket. I will need 39 total, and then I'll crochet a border around until it's big enough. Some people have done half-hexes to make the edges of their blankets even, but I think I will like the uneven edge that follows the shapes of the whole hexagons. Especially if I work a number of stripes for the border. I'll have to see how quickly it goes; maybe I'll do one single crochet stripe of each of the seven colours. Making hexagons is ridiculously fun. I'm especially enjoying the part where I join them together as I go, and the part where there are no ends to be woven in afterwards, because they're just worked in. Why did it take me so long to pick up a crochet hook? This is great! This entry was posted on Thursday, January 20th, 2011 at 10:21 and is filed under babyclothes, crochet, gifts, hexagon blanket. You can follow any responses to this entry through the RSS 2.0 feed. Both comments and pings are currently closed. sweet deal! which pattern are you using, or did you use a short tutorial to piece them together? that blanket is going to be too cute!